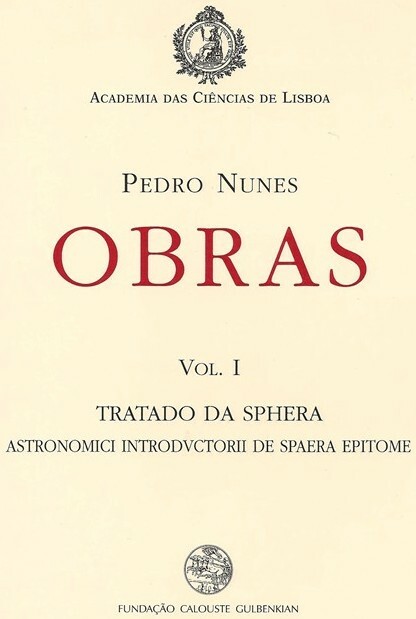 Nunes, Pedro, Obras, Volume I: Tratado da Sphera; Astronomici introductorii de spaera epitome (Lisboa: Fundação Calouste Gulbenkian, 2002). Nunes, Pedro, Obras, Volume II: De Crepusculis,(Lisboa: Fundação Calouste Gulbenkian, 2003). Nunes, Pedro, Obras, Volume III: De erratis Orontii Finaei (Lisboa: Fundação Calouste Gulbenkian, 2005). 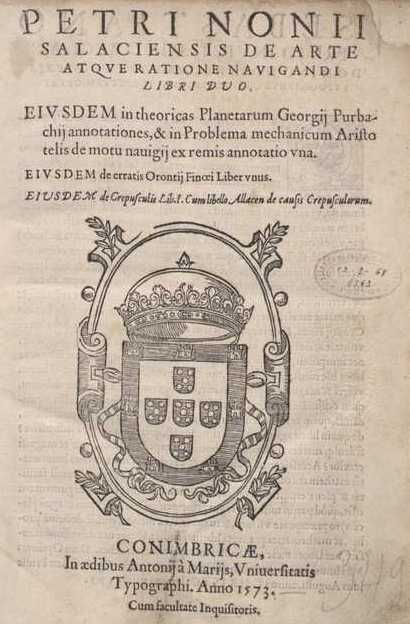 Nunes' Portuguese translation of Sacrobosco's Tractatus de Sphaera, the chapters on the Sun and Moon from Peuerbach's Theoricae nouae planetarum, and Book I of Ptolemy's Geographia. Most importantly this book contains two original works on navigation: Tratado que ho doutor Pêro nunez fez sobre certas duuidas de nauegação and Tratado (...) em defensam da carta de marear. This two works signal the beginning of mathematical navigation. In this book Pedro Nunes adresses the problem of the duration of twilights. He explained that this duration depends of the place of the observer and of the time of the year and, for the first time, established the mathematical conditions to observe a minimum twilight. It was also in this work that Nunes presents the concept of a nonius scale. 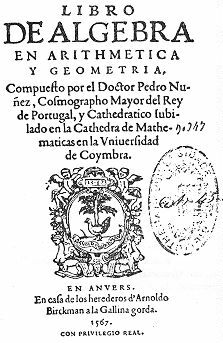 A refutation of Oronce Finé's (professor at the Collège Royal de Paris) claim to have solved the three classical mathematical problems (to double a cube, to trisect an arbitrary angle, and to square a circle). Latin translation of the Tratado (...) sobre certas duuidas de nauegação and a much more extended version of the Tratado (...) em defensam da carta de marear. The book contains many new results and is perhaps Nunes' most important publication. Of special interest is the first presentation of a mathematical theory fr the loxodromic curve. Nunes started working in the manuscript of this book about 30 years before its publication. The book is divided in three parts. In the first, Nunes dealt with the resolution of first and second degree equations with one variable; in the second, dealt with proportions and algebraic calculus; in the third, again with equations resolutions, including third degree equations. 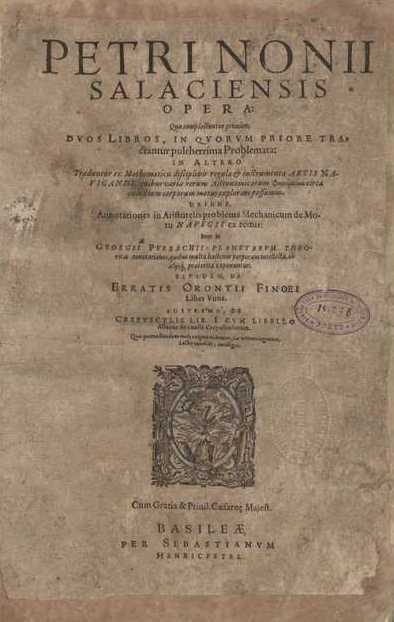 De crepusculis, Second edition (Coimbricae: Antonius a Marijs, 1571). 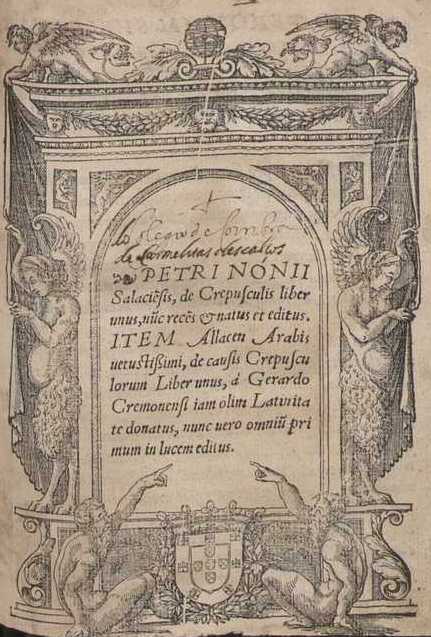 The first edition of Petri Nonii Salaciencis Opera came out with many errors. Nunes decided to publish this improved second edition in Portugal, under a diferent name. A "second" edition of Nunes' Opera, by the same printer of the first edition. This used folios from the 1566's edition but followed the internal organization of De arte atque ratione navigandi. Nevertheless, the mistakes found in the first edition were not corrected. 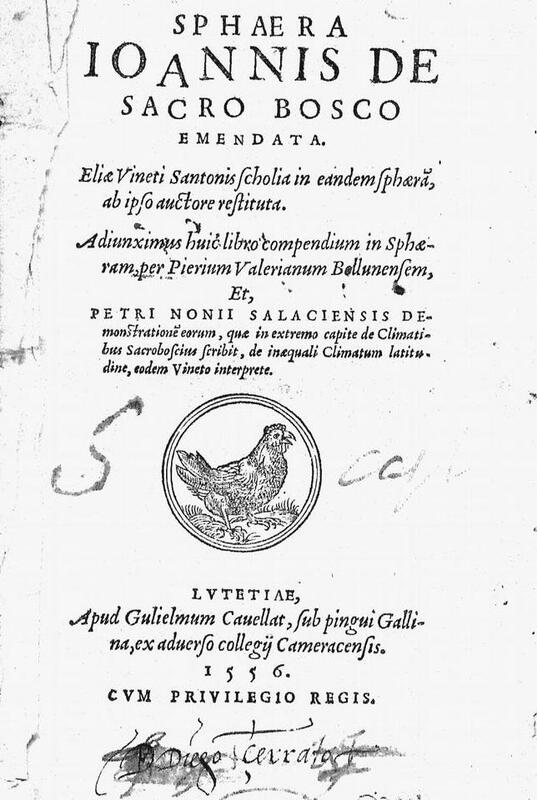 Nunes' Annotatio in extrema verba capitis de climatibus (Notes on the last words of climate's chapter from Sacrobosco's Tractatus de sphaera) was definitly his more published text. 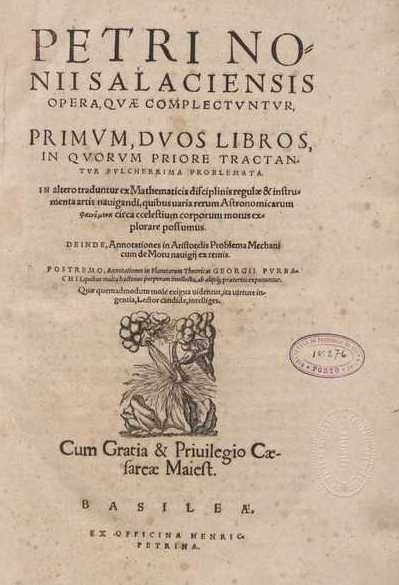 This happened because it was included in Élie Vinet's (1509-1587) many editions of Tractatus de sphaera. [Manuscrito de Florença], Florence, Biblioteca Nazionale Centrale de Firenze, codice palatino 825. De ortu et occasu signorum. De globo delineando ad nauigandi artem.